A film that promises much, but delivers little when it comes to a functional and meaningful narrative. Critically acclaimed and well-appointed—with Jeff Bridges as the aged Antagonist Texas Ranger and Ben Foster and Chris Pine as the young Protagonist bank robbers— Hell or High Water fails to live up to its promise. The tracking shots past advertisements for debt relief and reverse mortgages paint a bleak and depressed countryside and hint at a complex social commentary hidden within the story. Unfortunately they function better as choice sound bites in a trailer rather than touch points within a persuasive narrative. In short, the film aims high and hits low. This isn’t to say that the film isn’t an enjoyable experience. Bridges is amazing and the rising tension as things go south for the brothers is palpable—it just doesn’t add up to very much in the final analysis. Key to this unfortunate result is the lack of a changed paradigm anywhere within the narrative. In order for a story to be a complete story and in order for it to mean something to an Audience there must be a significant paradigm shift within one of the points-of-view. Characters grow and develop throughout Hell or High Water, but they all grow into their resolve with neither of them growing out. It would appear that Pine’s Toby Howard is the Main Character Throughline of the narrative as he is the only one we come to know personally. Unfortunate circumstances left him unable to pay child support to his ex-wife and out of shame, kept him from seeing his two sons for over a year. These are deep personal issues that Toby would take with him into any narrative—clear indications of Main Character Throughline material. Toby’s brother Tanner would seem to be the natural choice for Influence Character—Toby is more conservative and introverted when it comes to robbing banks, Tanner is more out-going and impulsive. However when it comes to their perspective on Texas and how to survive, they’re both on the same page. They may be at odds objectively, but subjectively they share the same basic understanding of the world. Their conflict exists in their roles as Protagonist and Contagonist, not as Main Character and potential Influence Character. The only other option for Influence Character is Bridges’ Texas Ranger, Marcus Hamilton. At 70 years old, Marcus continues to cling onto a vision of the old West that no longer exists. In Hamilton’s mind, fellow Ranger Alberto Parker (Gil Birmingham) is Tonto to his Lone Ranger. Racist jocularity and old-fashioned intuition are relics of the past, relics Hamilton can’t bring himself to release. One would assume that this is the great subjective debate going on in the narrative of Hell or High Water: the fight between Hamilton’s vision of the old West and Tanner and Toby’s reality of the new West. Old fashioned justice vs. do whatever you need to survive. Yet they never meet throughout; the Relationship Story Throughline that should be there between them to help support the argument between these two competing points-of-view fails to materialize. —and then Mom shows up in her SUV. In one of the most disappointing Deus Ex Machina scenes in recent years, Toby’s ex-wife and sons exit the truck, introduce themselves to Hamilton, and walk inside—effectively destroying any meaningful outcome from the day’s events. Does Hamilton leave unavenged because he is finally ready to accept the end of it all? Or did he leave because Mom showed up and ruined everything? We’ll never know because that is exactly what happened. It’s like that time when Jenny told Forrest she’s sorry…after she finds out she has AIDS from having all her fun. There is no emotional significance if a character changes because they have to. It’s not like Hamilton is going to blow Toby away in front of the man’s kids—he isn’t that kind of person. So we never know exactly why the Ranger does what he does. The film cheats us out of any significant meaning. Hamilton rises, bids his goodbyes, and then leaves. Both men promising they’ll see each other again, tagging their conversation with “unless I see you first”—a phrase that seemingly says a lot, but really says nothing. Toby remained steadfast by not losing it the way his brother would; Hamilton remained steadfast by promising to be a factor in Toby’s life. With no Changed character in sight, the narrative breaks down. We don’t know which approach was more appropriate or why the film ended the way it did. We just know Bridges is a great actor. 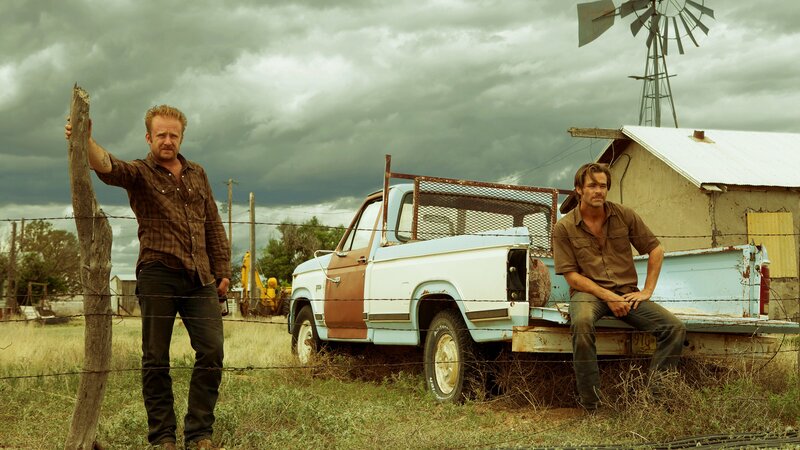 Hell or High Water, like many films in the “new” Hollywood over-promises and under-delivers. The trailer is remarkable in making the film look deeper than it truly is, and should be held up as a shining example of what a studio should do to help sell a film with a deficient story. See the film for the performances and the raw reality of the situation. Be prepared, however, to be disappointed as you try to understand what it all meant. Dysfunctional narratives, by their very definition, fail to add up to something more than their individual parts.